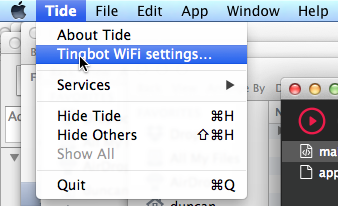 By using Tingbot and Tide you agree with our terms and conditions. You've followed the assembly instructions, your Tingbot is assembled and ready to go. 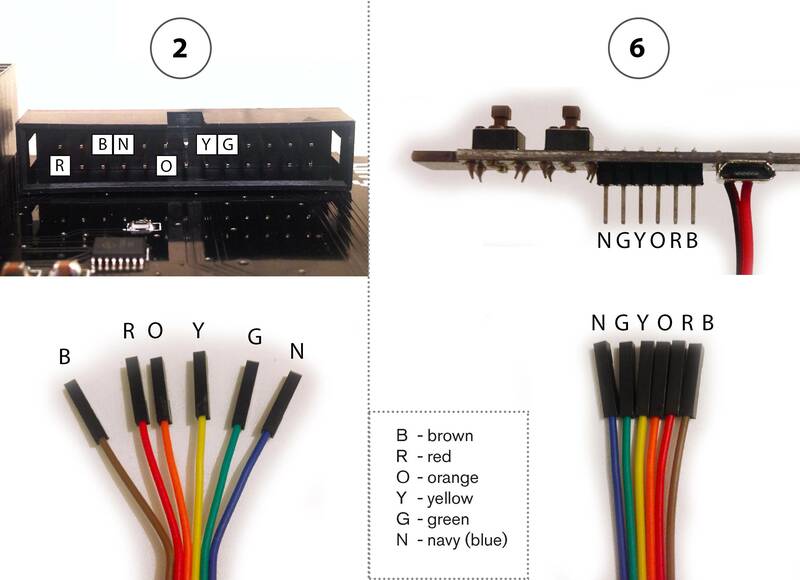 If you have the 2016 version of Tingbot (in the brown box), use these assembly instructions. Make sure your wiring matches this diagram before you continue. If in doubt, go back and double-check. A quick note before we begin - you'll need a microSD card and a card reader on your computer. 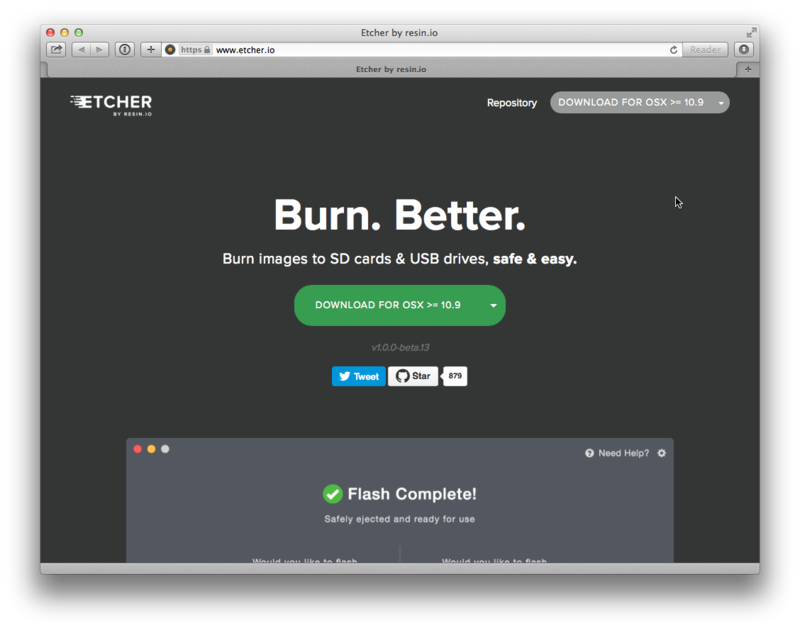 We recommend an 8GB or more card, but you could probably get away with 4GB. 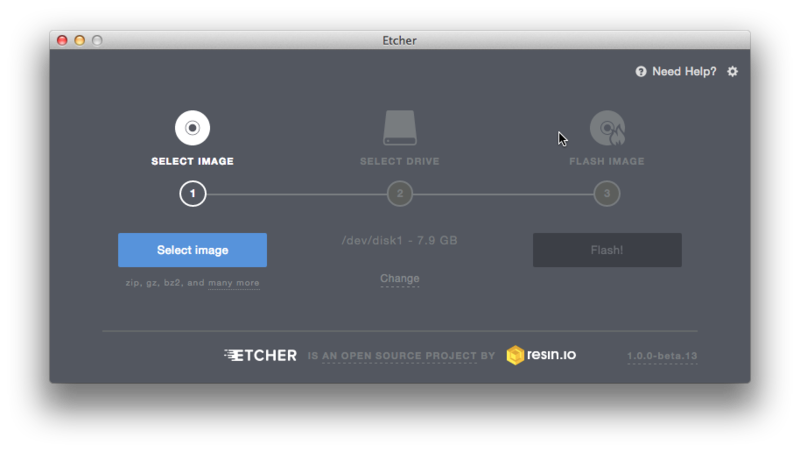 Visit etcher.io and download Etcher from there. 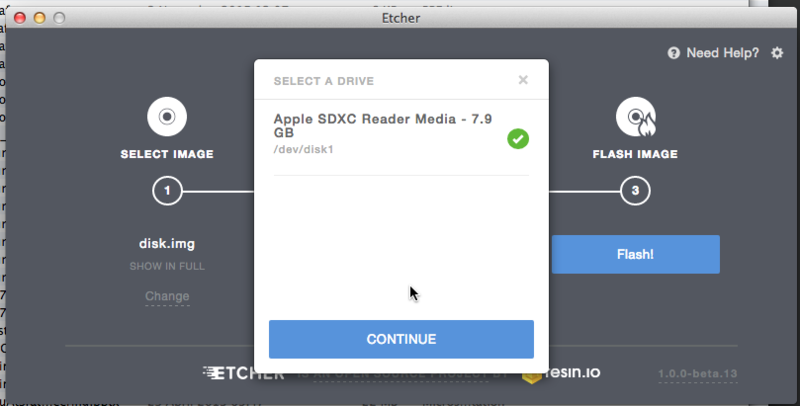 Aside: The above screenshot shows the selection of the Mac's drive that corresponds to the in-built SD card slot that has had the micro SD card inserted (in its SD card adapter). Please make sure on your own machine that the correct drive is selected! 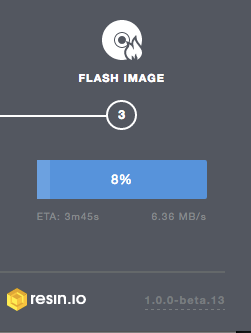 The time it will take to flash the 1.5GB image will depend on the speed of the micro SD card. 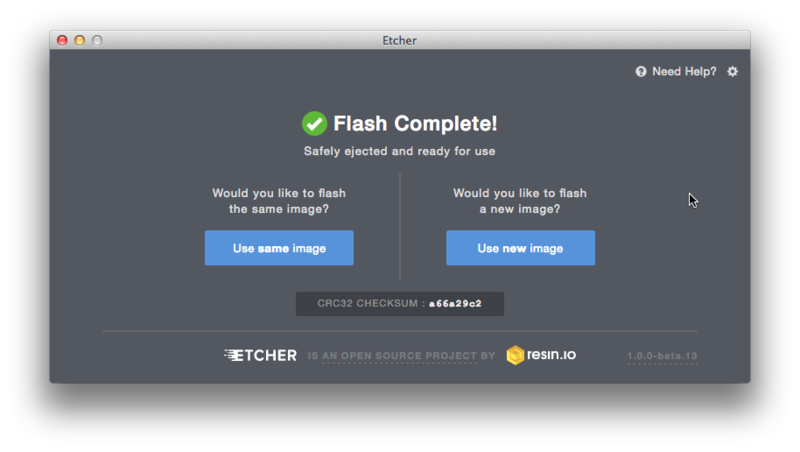 Etcher provides a handy ETA to completion! Aside: The CRC32 checksum in the above image is likely to be different to the one reported for the final release version. When invoked Tide starts up with an untitled - hello world - template program file. You can find out more about this in the Writing your first app section. 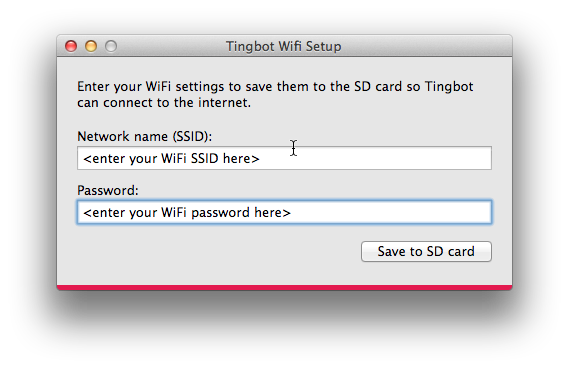 Configuring the WiFi settings on the SD card is the next step. 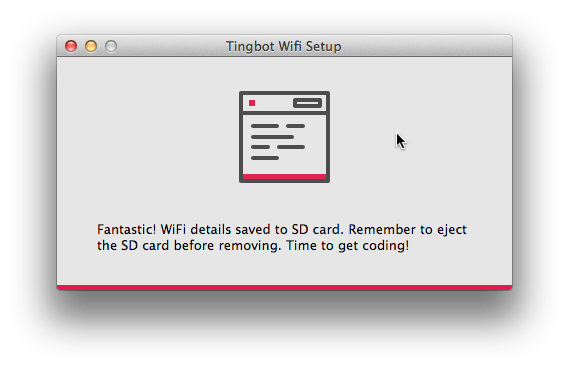 Eject the Tingbot OS SD card, insert the micro SD card into the Tingbot and plug in the Tingbot power supply. As this is the first time the SD card has been used the Tingbot it will go through a partial boot up sequence to expand the image to the full capacity of the SD card. 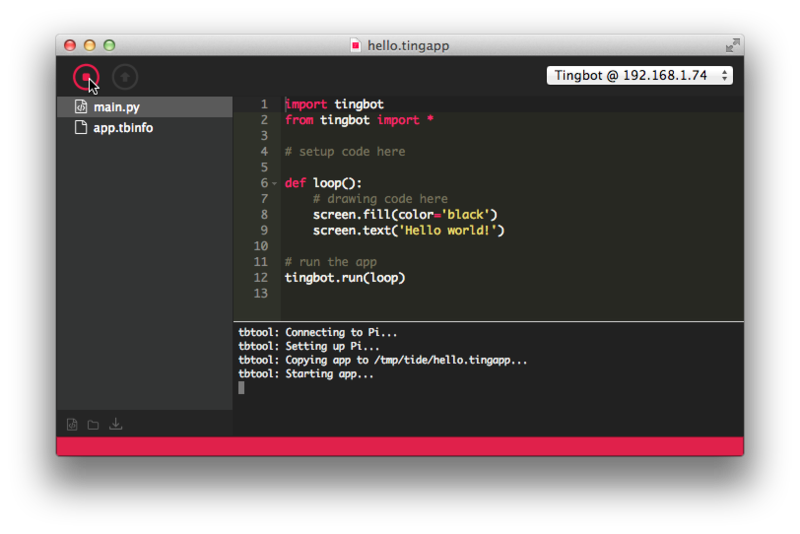 Once the image has been expanded the Tingbot will automatically reboot - this time to the Home screen - the Tingbot's UI. 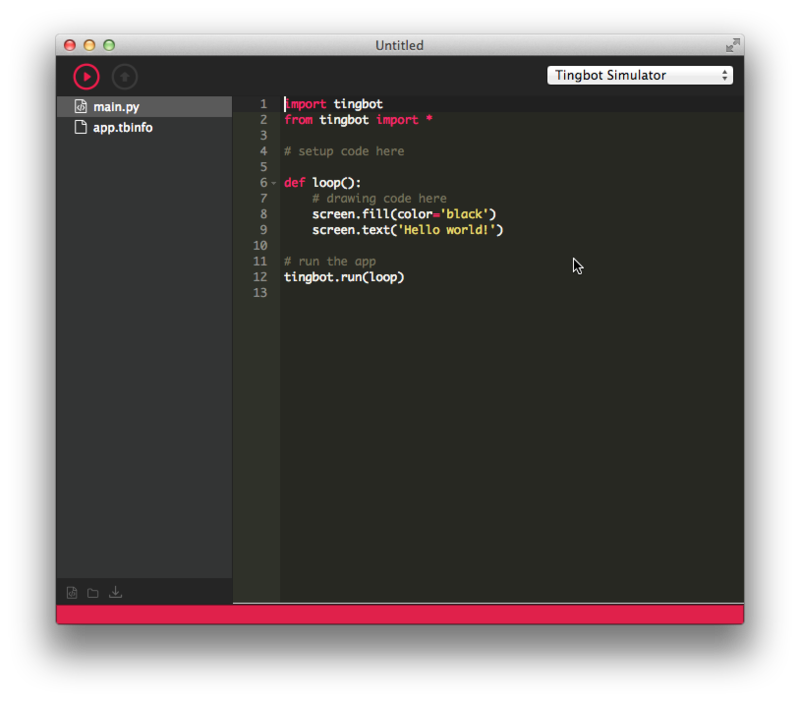 The first thing to do is to use File -> Save As... (or File -> Save) to save the Untitled template Tingbot application as, say, a file named hello.tingapp. 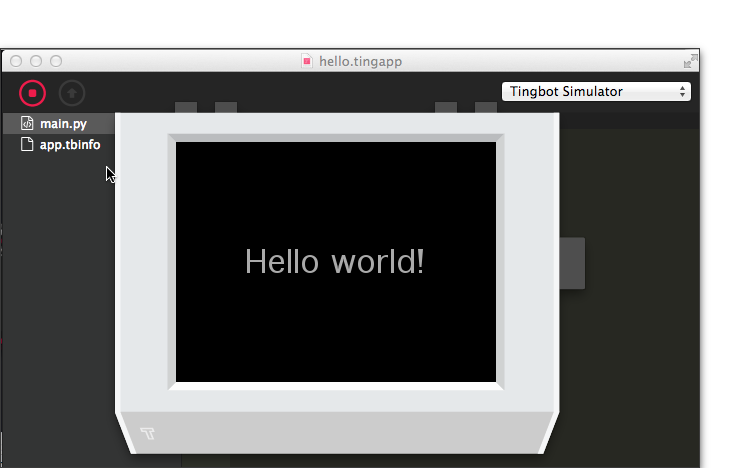 Now 'Run' the program in the Tingbot simulator and the simulated Tingbot will pop up! Let's do this. Select the real Tingbot rather than the simulator and press the Run button again. In the console at the bottom you'll see the app get copied and started on the Tingbot. Check your Tingbot - it should be saying hello! Hold the two middle buttons on the Tingbot together to return to the home screen. By using the Run button you can test apps without installing them. Once you're happy with an app, you can install it using the Upload button. Try it! Select the real Tingbot rather than the simulator and notice that the Upload button is enabled. Clicking on this button will cause your app to be uploaded to the Tingbot. Note Scrolling through Springboard will show the newly installed application as 'hello.tingbot' but we'll explain why later. If you have scrolled to hello.tingapp you can start it by tapping its screen icon. Next up, we'll explain the process of writing your first Tingbot app.